April Kennedy...My Life + My Style: Set Thine House in Order. 'Set Thine House in Order' is a scripture verse that I read this morning and it resonated deep within my soul. A house of order means different things to me. First I think of physcial order. And remember, my house is not physically in order. Every room is unfinished in some way. When my house is out of physical order I feel out of order. Maybe that is why I was so sick last week! I'm working this week on getting the rooms that can be organized....organized. And, I'm feeling better about it already. After reading my scriptures, I wanted more on this topic. There was still a second part of 'House of Order' that was weighing on my heart. It was the spiritual aspect of house of order. I know I am not doing all I can do to 'organize' my children. To care for them. To raise them. Then I found this excerpt from a talk by Russell M. Nelson. It was exactly what I needed to read. I wish I could have a do-over some days in the parenting department. This quote gives me guidelines that I want to live by. I want to discipline with love. I want to lead my children to the Lord, not restrain them by my words or actions. and makes me want to put my house in order in every aspect. Such a good reminder about setting things in order! It's hard sometimes to see a big mess or piles of clutter here and there and not feel defeated before you (me) start--even though you (I) know how great it feels when it's finished. So...good job on the PROGRESS you've made so far. Things are looking nice! Glad you're feeling better! And I like your bloggy re-do too! I love that quote...I too, have many a day where I wish I could have a re-do with my little son. Parenting is the most awesome thing I have ever done, but it is also the hardest. :-) It definitely provides a wonderful training ground for my soul to learn and grow. Loved your Blog Sugar post, btw. I am so sad I didn't get to attend. So happy to hear you are feeling better. Wow. Talk about a do-over day. Sheesh. This was perfectly timed for me. I've felt like an ahole++ parent today...and clearly, with this post and scripture, it is so. 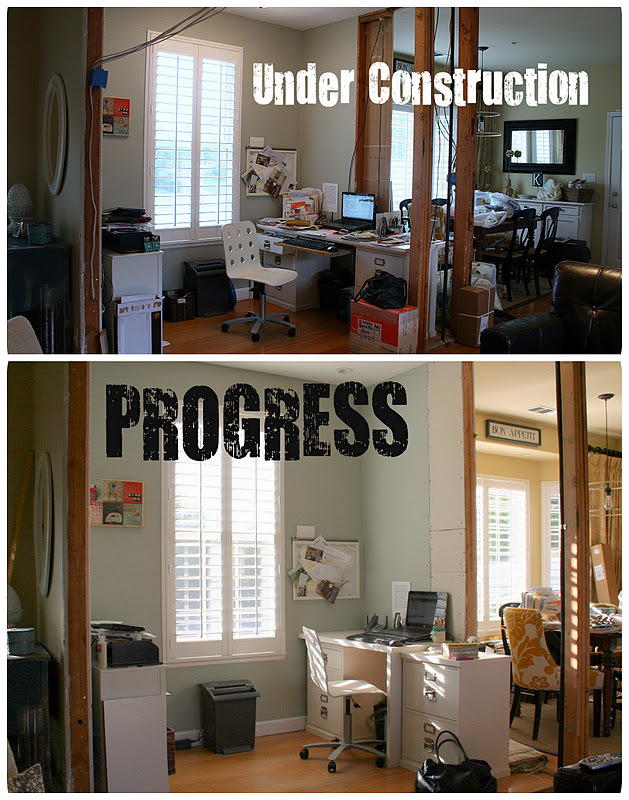 i love that progress picture! and that quote is absolutely perfect for my mirror. Elder Nelson always has the perfect gems. I've been feeling out of order lately, too. Thank you for the sweet words. You inspire and encourage me often. P.S. I'm loving the new look! What a difference in the pictures! I am glad there has been progress. What a great quote! I love when I read and a quote particularly inspires me. Those moments are miracles in our lives. I love this quote, and it is a good reminder to me to put the laptop away and pay attention to life around me. That is a good reminder. whoaa!! love the pictures side by side (well top and bottom)! the wall color is soo lovely!! I am currently working on getting our home in order. It takes time...but I think if I do actually do things correctly this time...it will stay that way! My problem is I just dump everything in baskets when I'm tired and just want to SEE order. Well I might see it but everything is just in the baskets and a jumbled mess!! I love Elder Nelson. I am a Seminary teacher and just quoted him yesterday. Love coming here...my style for sure. I have pinned several of your pics! !